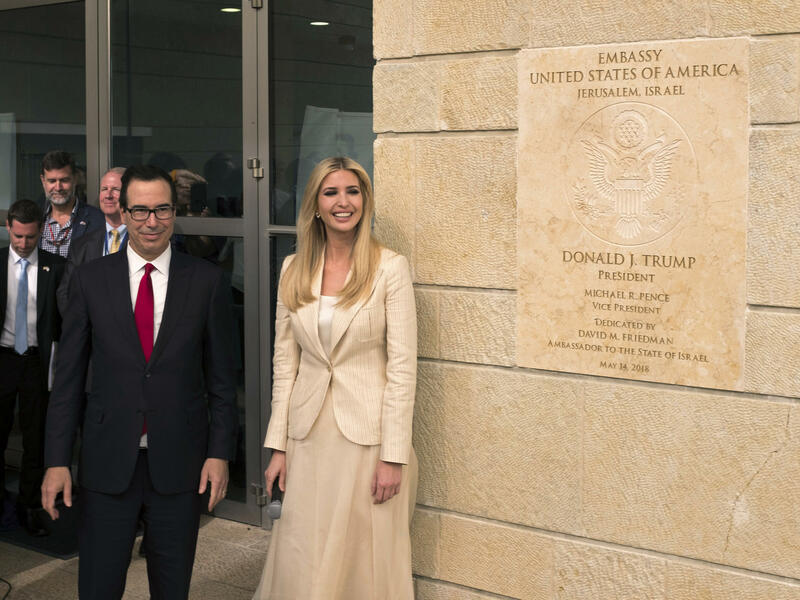 It's no coincidence that the official opening of the U.S. Embassy in Jerusalem came 70 years to the day after Israel proclaimed its independence. The country's founding 1948 document made no mention of God. Israel was established largely as a secular state. By contrast, today's U.S. Embassy opening was full of religious references, notably with an emphasis on evangelical Christianity. NPR's Tom Gjelten reports. 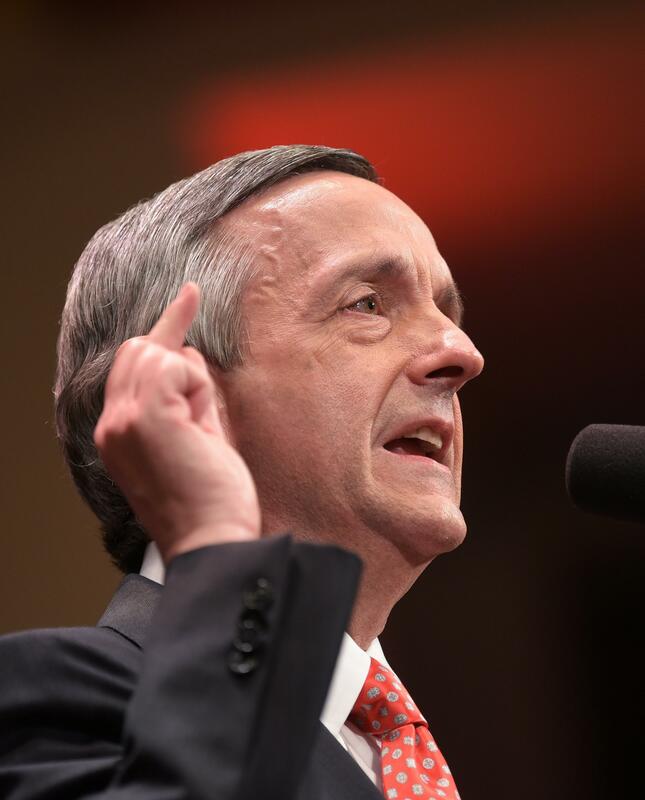 TOM GJELTEN, BYLINE: The invitation to give the opening prayer at the embassy opening in Jerusalem went to Robert Jeffress, pastor of the First Baptist Church in Dallas. There may be no Christian pastor more enthusiastic in his support for Donald Trump. And that came through in Jeffress' prayer to God. ROBERT JEFFRESS: We thank you every day that you have given us a president who boldly stands on the right side of history but more importantly stands on the right side of you, oh, God, when it comes to Israel. GJELTEN: Though he was surrounded by Jewish religious leaders, Jeffress closed his prayer invoking his Christian faith. JEFFRESS: And we pray this in the name and the spirit of the Prince of Peace, Jesus our Lord. Amen. GJELTEN: Jeffress is a fervent political supporter of Israel, though from a narrow Christian perspective. In 2010, he said that Judaism, along with Mormonism, Islam and Hinduism were religions, quote, "that lead people to an eternity of separation from God in hell." Given such remarks, the choice of Jeffress to lead the prayer this day struck some as inappropriate. In a tweet, former presidential candidate Mitt Romney said, such a religious bigot should not be giving the prayer that opens the United States Embassy in Jerusalem. Asked about that tweet this morning on the "Fox & Friends" TV show, Jeffress said the things he's quoted as having said about Jews and others not going to heaven only reflect Christian teaching. JEFFRESS: Historic Christianity for 2000 years has taught that salvation is through faith in Christ alone. And the fact that I and tens of millions of evangelical Christians still believe that is not bigoted and it's not newsworthy. 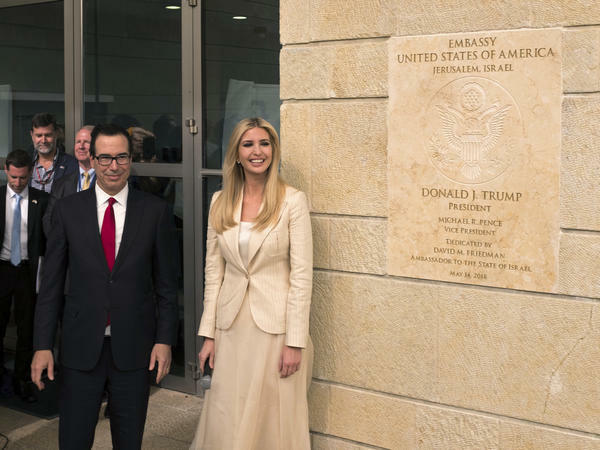 GJELTEN: A State Department official today defended the choice of Jeffress to pray at the embassy saying, Jerusalem is a holy city for millions of people around the world. We sought to reflect that in this event, the official said. Even among some who strongly supported the embassy move to Jerusalem, however, the Jeffress choice did not go over well. Rabbi David Sandmel directs interreligious engagement at the Anti-Defamation League. DAVID SANDMEL: This is a moment where we should be trying to send out a message of hope, of peace and of inclusion. And that's not the message that I think many people associate with Pastor Jeffress. GJELTEN: The benediction today was given by another evangelical Christian Pastor John Hagee. He's long-known for his support of Israel. But Hagee in the past has made comments critical of Catholicism. Republican Congressman Francis Rooney of Florida, a former U.S. ambassador to the Vatican, said in an interview on CNN that he'd have asked a radically different pair of religious leaders to speak at the embassy. FRANCIS ROONEY: I would have rather had a balanced scorecard. It would have suited me to have as broad of an ecumenical list of speakers and participants as they could get. GJELTEN: A White House spokesman today said the invitation to Pastor Jeffress reflected his strong relationship with many in the faith community. The Israeli government apparently had no objection. Prime Minister Benjamin Netanyahu speaking at the embassy quoted the Book of Zechariah where God promises to return to Zion and dwell in the midst of Jerusalem. As it happens, Zechariah is a favorite of Christians whose support for Israel is based on a belief the Bible prophesizes that when Jesus Christ comes back to earth, it will be in Jerusalem. Tom Gjelten, NPR News. Transcript provided by NPR, Copyright NPR.